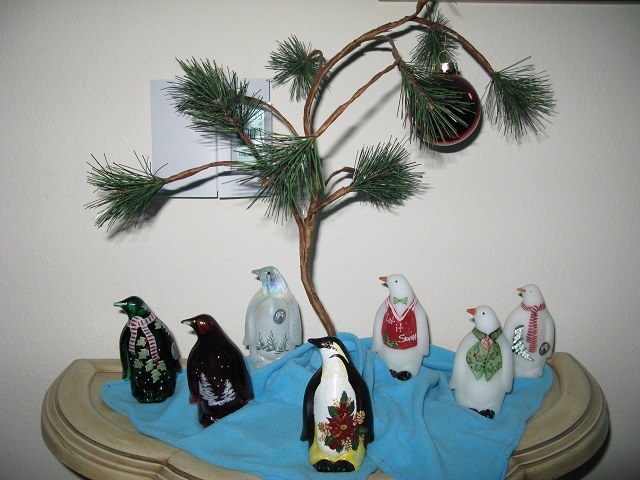 A Collection of my Fenton Glass Works Holiday Penguins !! ** FOUR DAYS TILL CHRISTMAS !! ** Scholar Lincoln's Progress !! a chilly Autumn Evening in front of a nice fire !! 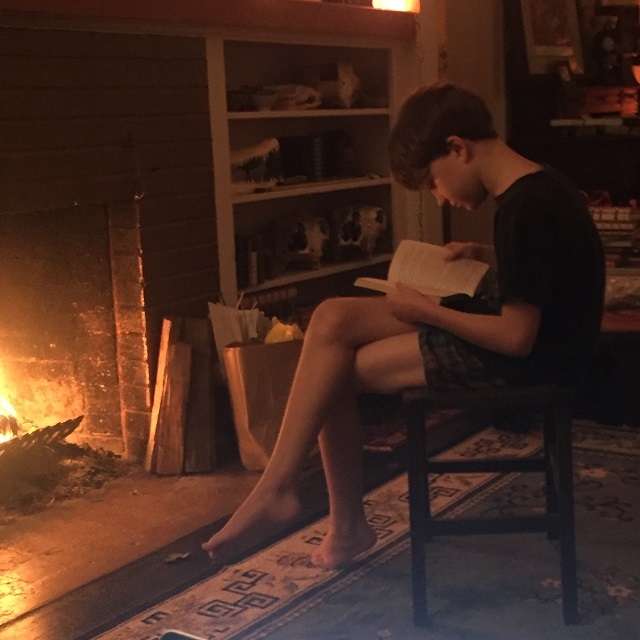 Scholar Lincoln enjoying a fine book in front of an Autumn Fire !! ** Ms Edith Kathleen McDermott !! was founded by William Morris (1834–1896). diverse bunch of people from all social backgrounds. William Morris while he lived in London. well known as an illustrator of books of that period. way with the artistic endeavours of the students. 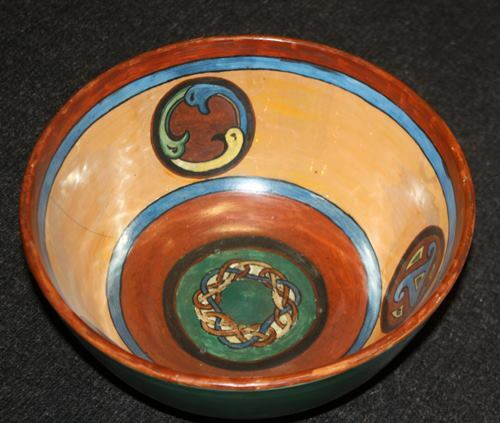 of the 1904 catalogue as Plain Milk Bowls 24s. 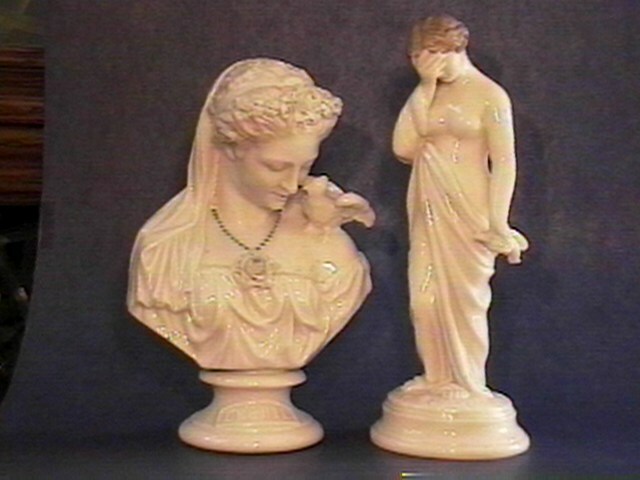 held in 1904 she exhibited a carved Walnut panel. 1911 (she) is listed as an Art & Crafts teacher. 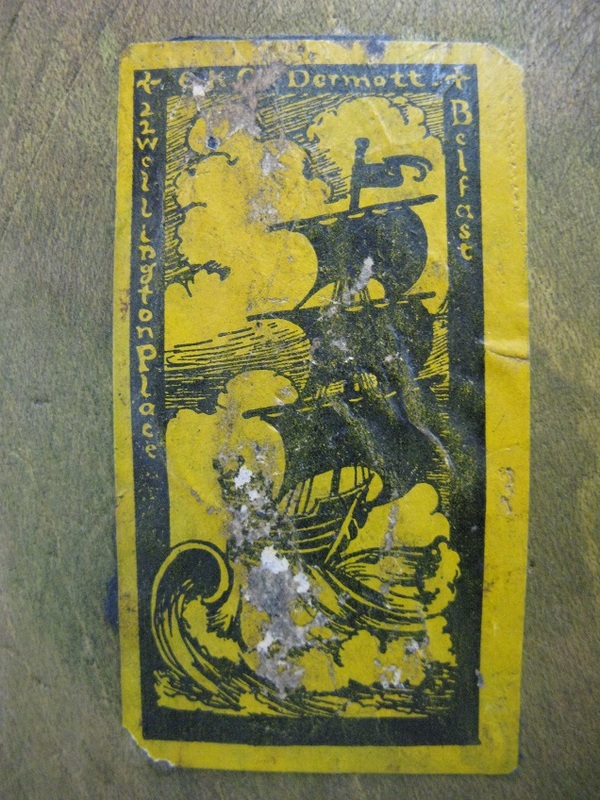 died in 1950 aged 73 at 84 Malone Avenue Belfast. interested to know more about her life and career." EK McDermott Family Census 1901 Census !! EK McDermott Family Census 1911 Census !! through the Years, in any condition is a wonder !! Belleek Pottery Ltd !! MANY THANKS !! 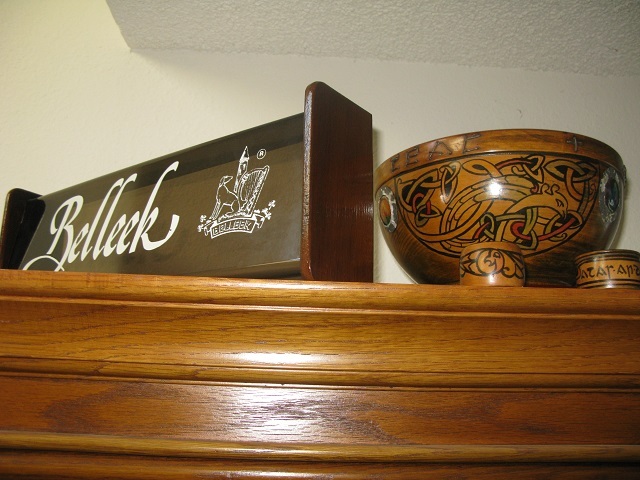 displaying a beautiful collage of Celtic Design !! 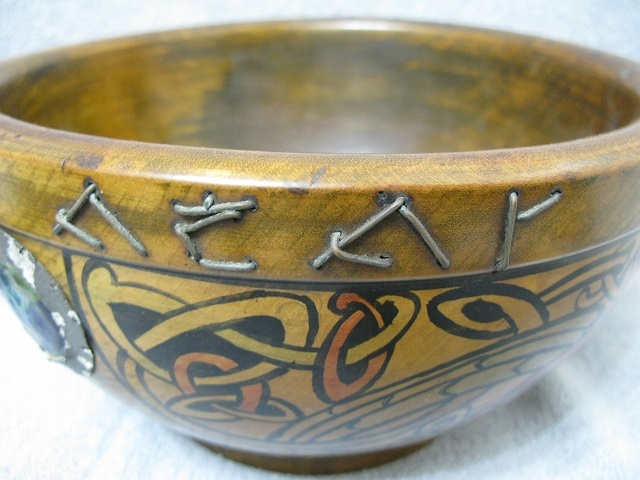 again, displaying unique and intricate Celtic Images !! on the Bottom of the 2nd Period Bowl !! 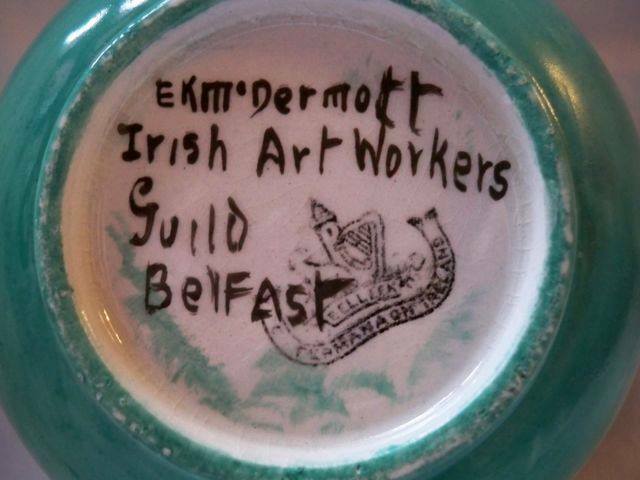 Irish Art Workers Guild (Belfast) !! 1890's to the period before the First World War. our 2017 Belleek Pottery Anniversary Gathering !! understanding of Translation from Gaelic to English !! had NO idea he was also an (Irish) Gaelic Scholar !! Alphabet available on Apple Computers ??!! � � � � � !! Diacritic marks aren’t just there for decoration !! and placement of that little accent !! see, it really is a major deal !! 'S's appear in a capital Gaelic 'form' !! with the Beginning of our 'Welcome' Message !! the Five Dot Mark !! VERY 'intuitive' ?? 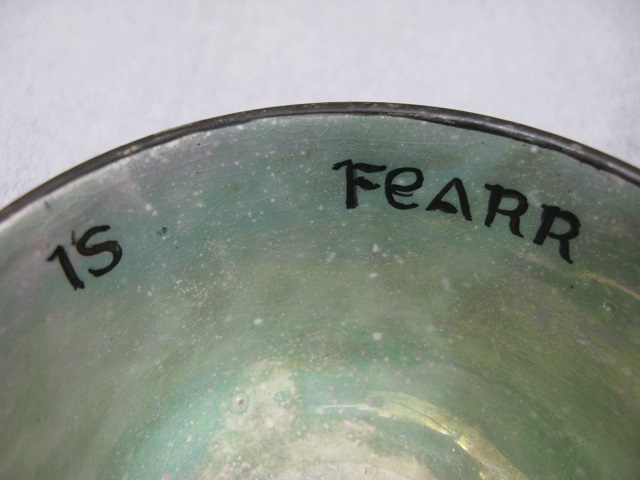 First Two Words of My Bowls Saying : IS FEARR !! 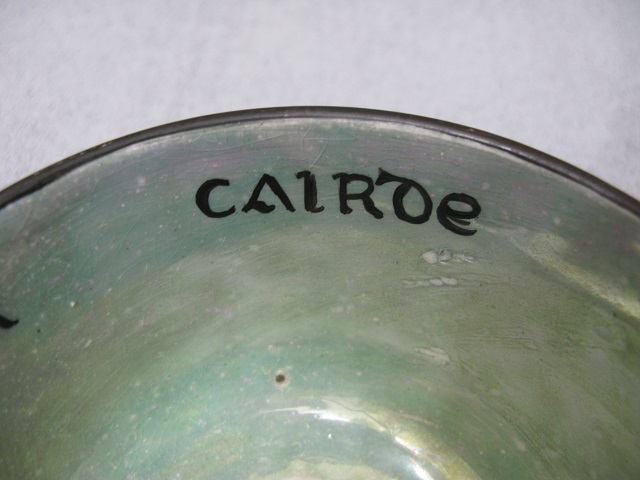 Third Word of My Bowls Saying : CAIRDE !! 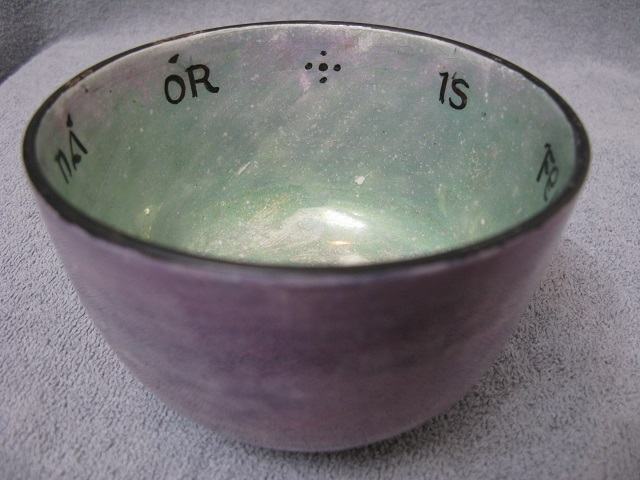 Final Two Words of My Bowls Saying : N� �R !! NOTE : the fada's on BOTH the 'A' and the 'O' !! By a 2nd Period Belleek Pottery Mark !! 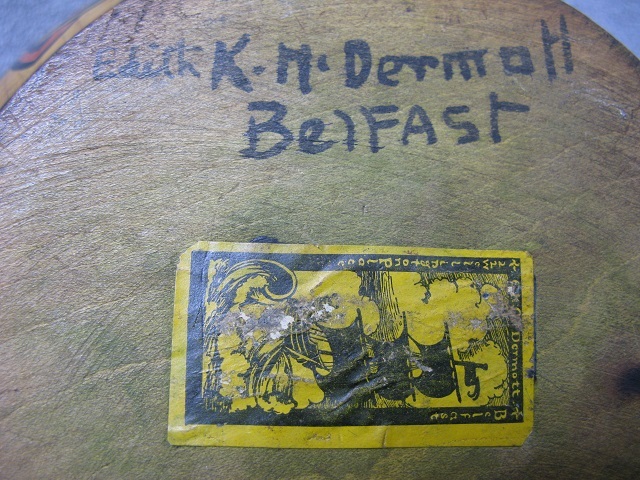 by Edith Kathleen McDermott !! 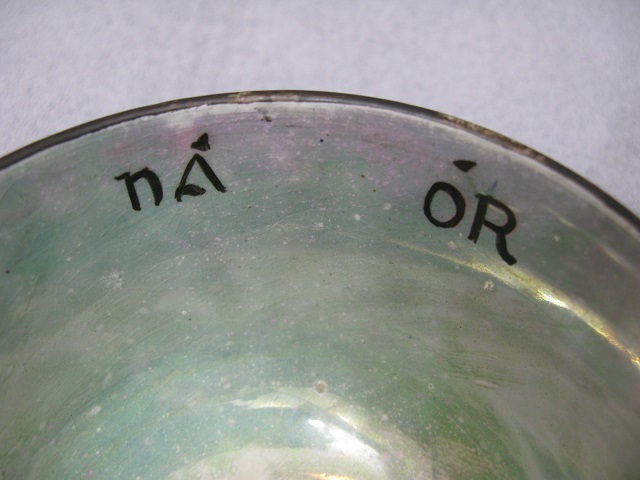 the second diacritic mark utilized in Old Gaelic !! consonant, ‘softens’ the pronunciation of that letter !! I cannot locate these definitions again ?? a consonant in spelling and writing Modern Irish !! that it is lenited !! bh ch dh fh gh mh ph sh th, respectively !! 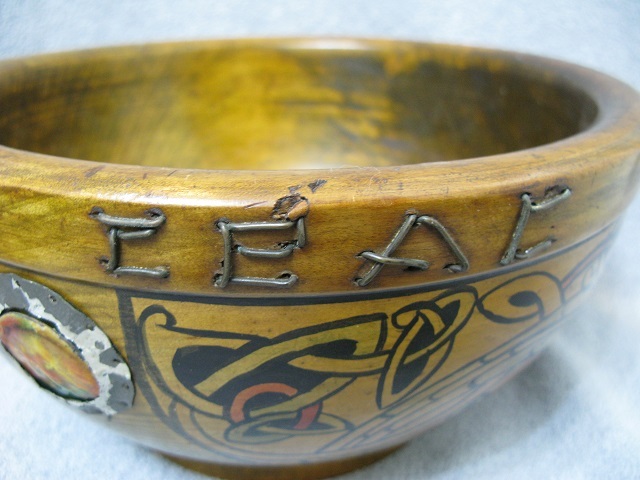 a mh�thair (mother), in Modern Gaelic or Irish !! diacritic mark remaining is the fada !! FINALLY completed my 'special' presentation !! 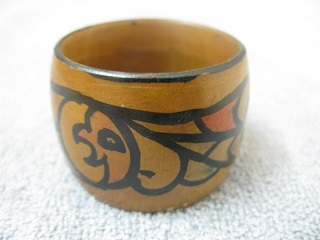 form of 'kiln fired' enamel ?? Along with a SPLENDID Enamel Disc !! Followed by the First Word of its Expression : Atas !! Along with the Second Word : ar !! 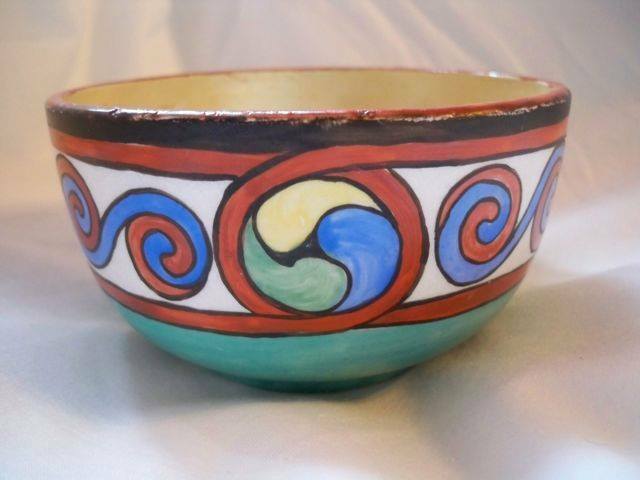 As well as Another Bright Enameled Disc !! Then the Third Word : do !! And Finally, the Remainder of Our Expression : teac !! 'Happiness on Your House' (or) 'Your Happy Home' !! 'Joy to Your Home' !! 'Happiness' as well as 'Bliss', among many others !! BUT additionally, peace and tranquility !! 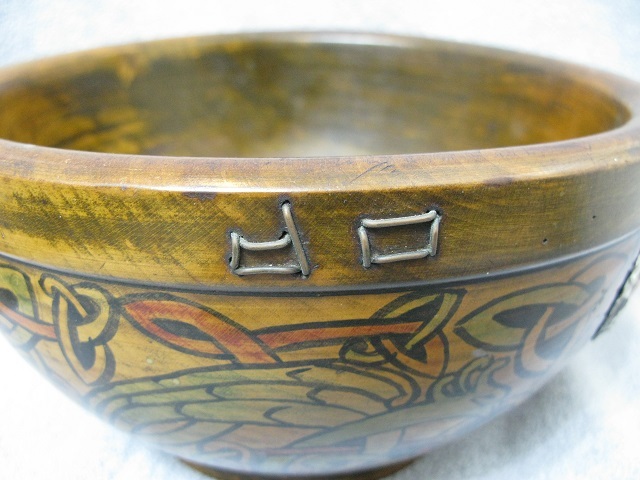 on the Bottom of Her Wooden Bowl !! 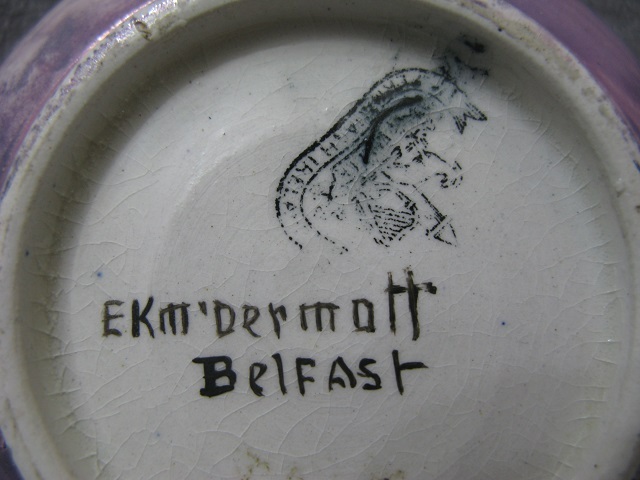 A Close Up of EK McDermott's Shop Sticker !! from the photographs above !! Concave Napkin Ring !! 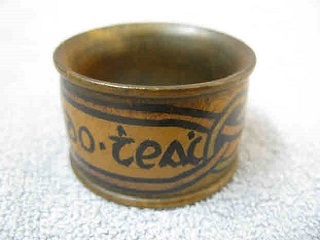 Convex Napkin Ring !! 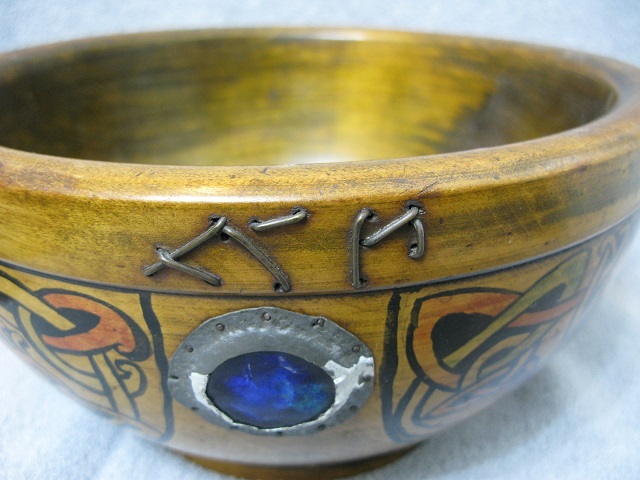 Above, I've pictured the 'matching' napkin rings !! 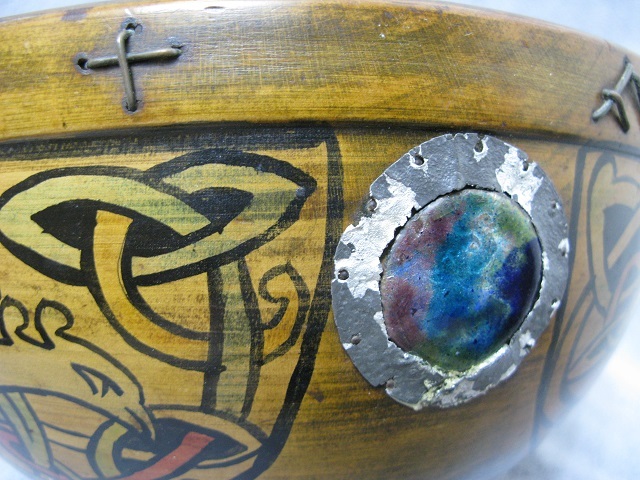 on it, just the Celtic Design you see encompasses it !! the expressions concave and convex defined properly ??!! Sitting on Display Atop One of My China Displays !! mark of a TRUE artist, working with multiple mediums !! your current ID and I'll get you back on my list !! get you BACK onto my Circulation list !! THANKS !! would like automatic notification of new Newslettres' !! receiving upcoming Newslettre notifications ! !